Today’s ‘Surname Saturday’ post takes us back in time to meet the Howlett family. The Howlett family are part of my paternal family tree, and give me one of very few tickets back through time beyond the fenland of Cambridgeshire. Okay, admittedly it’s only to the adjoining county of Suffolk, but compared to most of the rest my ancestry – that’s the equivalent of the moon! My most recent Howlett ancestor was Elizabeth Howlett. She was born to Thomas Howlett and his wife Caroline (née Clark) on 3rd March 1856, in the small parish of Kenny Hill – not far from Mildenhall, Suffolk, England. Thomas was the 6th of the 7 children of John Howlett and his second wife Elizabeth (formerly Goodings, née Poll), and the 8th child for Elizabeth after her first marriage to Michael Goodings ended with his premature death at just 27yrs. John Howlett – my Great x 4 Grandfather, born in about 1786 in Ashfield, Norfolk is currently the extremity of my research. Likely suspects for his parents remain elusive. For John, this was his second marriage, and as I look back through my file, I see that I don’t yet know who my earlier Step-4x Great Grandmother was… or whether there was an earlier flock of Howlett children. I suspect there may have been – 38yrs in the 1820s, was probably leaving things a bit late! John is noted as a Weaver in 1824, and again in 1828 – just like his new-found father-in-law, Ishmael Poll (who is specifically noted as being a silk weaver). Wymondham had a booming weaving industry, and therefore once mastering weaving, there would have been plenty of looms around. Trade via Norwich, and Norfolk’s plentiful coast, no doubt aided this. By 1841 though, he’s left weaving, and Norfolk, and appears on the 1841 census for Lakenheath, Suffolk, and has become a ‘labourer’ – undoubtedly on the fertile land surrounding his new home. He’d stay in the Mildenhall area of Suffolk until his death in February 1861. Meanwhile, by the mid-1800’s John and Elizabeth’s children are marrying and bringing new branches to their family tree. All seven marry – some twice, and most have children. Thomas’ little sister Elizabeth Howlett (1838) married George Gipp in 1854, and together they had 11 children – including the wonderfully named Rainauld Ishmael Gipp – presumably a nod to the child’s maternal silk weaving great grandfather. Thomas meanwhile, is working as an agricultural labourer. 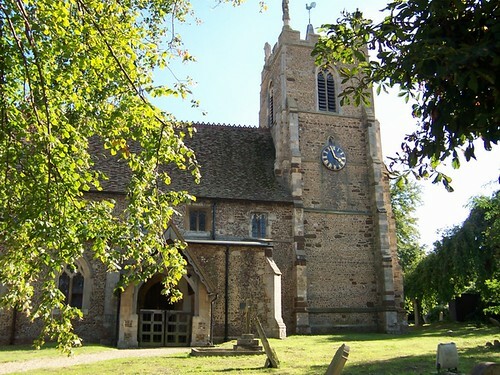 He married my 3x Great Grandmother, Caroline Clark in Mildenhall on 25th May 1855. Thomas and Caroline were illiterate, both signing the marriage register with an ‘x’. Ten months later, their daughter (and my 2x Great Grandmother) Elizabeth Howlett arrives. Life would have been hard for this young little family in the fenland, but it was about to get harder. Caroline Coe (formerly Howlett, née Clark) – my Great x3 Grandmother c.1911. Photo: Andrew Martin. Thomas died aged 23 on 28th May 1858. Just days after his 3rd wedding anniversary, and just weeks after his daughter’s 2nd birthday. He died at Whelpmoor, after suffering from Phthisis (essentially, Tuberculosis) for 9 months. He must have been in severe pain, whilst desperately trying to provide for his family. Caroline was by his side as he died. In later life, Caroline would go on to re-marry, to Robert ‘Dadda Bob’ Coe, and this new couple would spend their later years living next-door to her daughter Elizabeth as she married and raised her own family – this time with the Gilbert name.